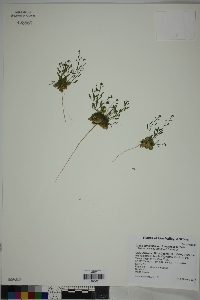 Draba cuneifolia var. integrifolia S. Wats. Stems pubescent with 3- or 4-rayed trichomes. Racemes to 3/4 of scape. Fruits oblong to linear or lanceolate, (5-)7-12 mm; valves: trichomes stalked and 4-rayed, sometimes with 2- or 3-rayed ones; ovules 20-44 per ovary. Flowering Jan-Mar. Rocky slopes and gravelly soil in desert scrub communities; 200-1800 m; Ariz., Calif., Nev., Tex., Utah; Mexico (Baja California, Nuevo León, Sonora).